What now? Gee thanks for asking... now we have homework and lots of things to do and think about. CPR certifications, blood borne pathogens certifications, letters of reference, life stories to tell (twice, by the way), family profile books to make. I need to get stamps and a fresh ream of paper and a clue. Target, no? A blessing for sure will be a Beth Moore study I am doing with the ladies. I will need an anchor for my fool heart during all this. Also I am trying to run again this summer. So far so good! I ran up Highway 9 from Lundeen today. Think I caught a semi draft here and there...probably not but I did it. Baby steps. Baby steps are the story of my life right now. Just do the one thing you know you are supposed to do. Oswald Chambers reminds me to simplify and just keep obeying one day at a time. Okay, so here's Bradie in an outfit her preschool teachers LOVED. For some reason unbeknownst. I call it the Angela Martin. 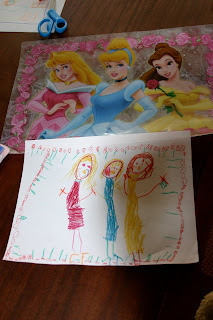 Check out the drawing Bradie did of her princess placement. Really, click on it! The detail astounds me. It is very exciting and precious to watch her create things. Even sweeter friends. 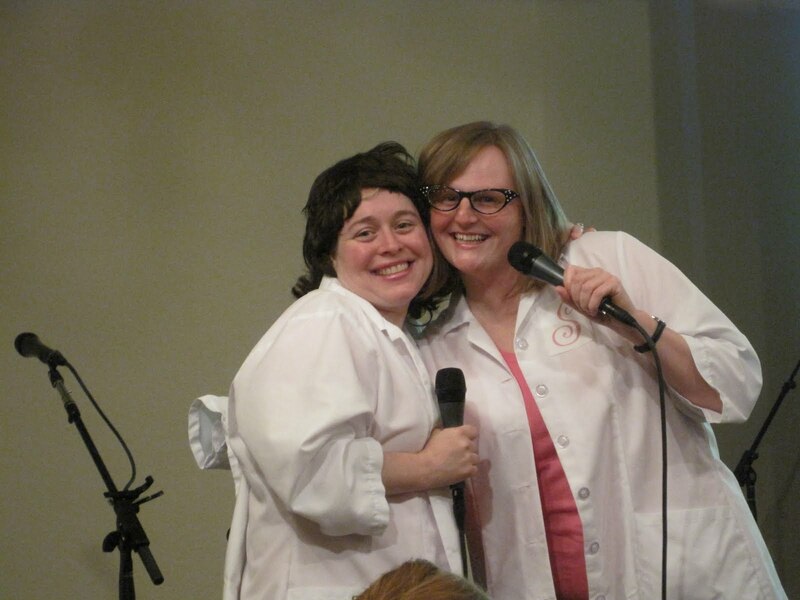 So a couple of months ago Lori asked me to help her do "program" (younglife style!) for our church's women's retreat. I nodded like a hungry animal and searched out my billybob teeth to pop in and get those creative juices a-flowing. It was super fun to put this together with a friend who has meant so much to me and has in many ways watched me grow up. Unfortunately Lori's purpose we found out was only to breathe life into our program, not to see it through. Her mom's battle with terminal cancer was nearing an end and she could simply not come to the retreat. But what was so special to me was that Lori believed in me and just KNEW I could do it and it would work out. BUT... I needed a partner. The thought of trying to do this alone made me turn green. Enter Christy. My dear friend Christy who is a type-A, plan it out, not in favor of surprises AGREED to put herself out there to help Lori and I. And she NAILED it! Really, most of the time as we were up front, making fools of ourselves, I just couldn't help but think in the back of my head, "Am I having TOO much fun?" Oh, and I also did the bulk of planning, filming and editing during our PRIDE classes which was NUTS, but worked out thanks to generous friends and Grandma Sally Johnson who help with our kiddos. So...phew... an update. There were lofty, vocabulous plans for these writs but as it is June I thought I really should just git er done! Also, we are done with PRIDE (I have to make up one day I missed due to feverish Beau) and then we'll do a 201 class with our agency. So far so good. Still leaning in and praying and hoping.